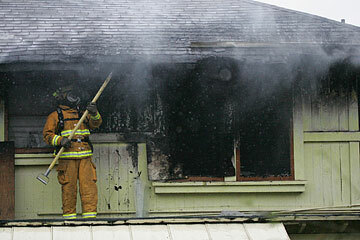 A firefighter poked at the roof of a two-story house destroyed yesterday by fire on Amelia Street in Kalihi. A Kalihi woman suffered serious injuries yesterday afternoon after waking up to find her home on fire. The woman managed to get out on her own and was sitting on the side of Amelia Street when firefighters arrived several minutes after neighbors reported the fire about 1 p.m. Firefighters treated the victim at the scene with oxygen, and she was later taken to Straub Clinic and Hospital in serious condition by ambulance. Neighbors noticed smoke and flames coming out of the second-story window of 1525 Amelia St.
"I think she was in shock," said neighbor Kalei Cleveland. "She got outside and didn't call for help or tell anyone what was happening." The victim, described as in her 20s to 30s, told neighbors she had been sleeping when she heard the glass windows cracking from the heat and woke up. "After that, she tried grabbing everything, but said, 'The hell with this,'" Cleveland said. Honolulu fire officials said the fire caused about $250,000 in damage to the contents and the inside of the house. "Right now, the second floor is unstable. ... The inside is gutted all the way to the back," said Honolulu Fire Department spokesman Capt. Kenison Tejada, who noted that fire officials have traced the origin of the fire to the rear of the second floor but are still investigating. Because of the fire-weakened floor, Tejada said firefighters had to go in with one hose at a time to battle the blaze.